The Free Software Foundation has been defending your freedoms as a computer user for 30 years. CC BY SA 2.0 greenoid. We have never done this work alone. There are hundreds of GNU projects out there, creating and maintaining software that gives us complete freedom and independence. There are hundreds of thousands of activists all over this planet, standing up against powerful opponents to fight for a better future. There are teachers, lawyers, librarians, web developers and researchers who all understand that without free software, we cannot have a free society. We are a community. The Free Software Foundation is the bedrock of this community. 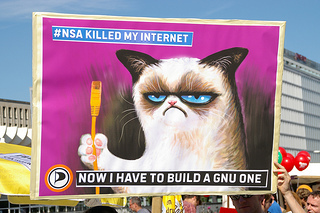 We protect the GNU General Public License and help its use spread. We carefully monitor everything that governments, standards bodies, and hardware and software companies do. When we detect a threat, we sound the alarm, develop a well-informed strategy, and coordinate the community, who stand with us to demand change. We devote staff time and resources to supporting free software projects, helping them thrive. For 30 years we have worked toward the goal of complete and ubiquitous freedom for software users. We have done this work in a rapidly shifting industry, where big money has fueled big technological advances and even bigger destruction of our freedoms. Despite new threats that force us to play whack-a-mole, to be nimble and ever vigilant, we have made great strides since 1985. Today, it is possible to use a computer with complete freedom, and free software powers vast portions of the Web. The world is becoming more and more aware that technology is not neutral--it can be used for great good or great evil. There is more interest than ever before in software that will protect activists and whistleblowers who speak out, that won't sell our personal information to the highest bidder, and that will teach our children to cooperate, share, experiment and explore. In another 30 years, we believe that we can achieve our goal. We believe that free software can be everywhere, and that proprietary software can go the way of the dinosaur. With the experience we've gained, and our community surrounding us, we can win this. This season we're also launching another way you can help free software find new supporters. In this appeal, we have written about why we think free software is important. But maybe you have a different way of explaining the issues, or maybe there are different aspects of free software that are close to your heart. Now you can create your own personal contribution page, a space where you can, in your own words, encourage your friends, family, colleagues, and social media networks to support the cause. You'll get credit for all the donations that come from your page. In addition to knowing that you've directly helped secure the future of computer user freedom, you'll be in the running for some freedom-friendly prizes! Everyone who raises at least $250 will receive a $25 gift certificate to GNU Press. Those who raise $1000 or more will receive their choice of a combo pack of ThinkPenguin router and USB Wifi adapter or a $100 gift certificate to GNU Press. The person who raises the most money over $1000 will win the grand prize; a special autographed gift along with her choice of $500 travel scholarship to LibrePlanet 2015 or a Respects Your Freedom-certified laptop! We want to be here for another 30 years, fighting for free software, and winning. Please, give what you can, become a member of the FSF, and do what you are able to do to encourage others to give. The past, present, and future staff of the Free Software Foundation are grateful for your support.